This is the man on my wall. He has been there for about 4 years now and I’ve no idea who he is. 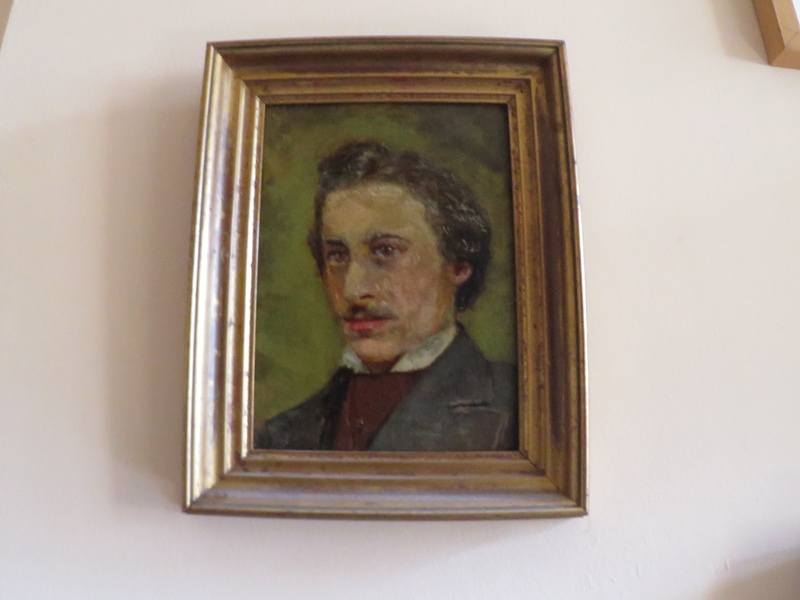 I bought this little painting at a small antique fair here in Dublin…..it was something of an impulse buy. I look at it every day. I have no choice really as I live in a one room flat but I’m not complaining……There is no signature. ‘ No date either. In between watching reruns of reruns on TV my eyes stray to this man. Who is he ? At night when I’m in bed ( which is to say when I’m lying on the floor) my eyes catch out his and I find myself wondering , ” Who are you”….. I wish I knew his story…. He certainly looks like a real person and not just the figment of some artist imagination. He’s dead now whoever he is. And I’ll be dead myself soon enough and so , sooner or later , will you. We all have THAT in common. In his life he could never have know that some day, generations after his death, his image would be sitting on my wall . Somewhere along the way this painting of him has been abandoned , made homeless and sent out into the big uncaring world. The people who cared about him in his life are now long dead and those who came after must not have cared enough to keep this picture in the family or perhaps they just forgot about him..
Now he has , after a fashion , been reborn into a virtual world he could never have imagined in his wildest dreams or worst nightmares. He’s living in the either of the world wide web. He has been reduced to a miniscule piece of binary code. He is timeless now and stateless too. He’s a million miles from where he was and just one click away. He is the man on my wall. He is my companion in the lonely hours – the wondering hours.